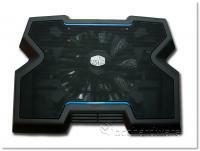 We have just taken a look at the Cooler Master NotePal X3 Laptop Cooler. This cooler supports laptops up to 17" and combines great performance with good functionality and a decent set of features for under $40. If you are looking for a cooler with a little extra flash, the X3 might be the one for you. Check our review for all the details.